Learning Spanish provides children with so many benefits that the title of the post should really read “Why Wouldn’t You Learn Spanish?”. Spanish is the second most spoken language (native language) on the planet? Between 329 and 358 million people speak Spanish. The USA has more Spanish speakers than Spain. Canada has over 900,000 Spanish speakers. The majority of Spanish speakers reside in Latin America. Spanish is an official language in 20 different countries. Fluently bilingual students score higher in verbal and non-verbal intelligence. Students studying a second language are superior in memory ability. Score higher in reading, language and math. Second language education strengthens first language skills. Students gain superior cross-cultural skills. Students display greater cultural sensitivity. Spanish bilingual education programs are growing in popularity in both the USA and Canada. 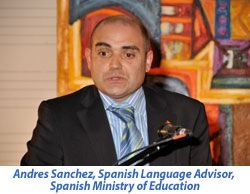 Calgary’s Board of Education is home to one of the most successful Spanish bilingual programs in Canada. From its humble start in 2001 with 150 students it has grown the enrolment to 1800 students in 2009. As of 2009 they are home to Canada’s first high school level International Spanish Academy at William Aberhart High School. Visit their website for more information on their Spanish Bilingual Program. Online Spanish resources are also widely available to student learning Spanish and many are free such as SpanishTown.ca which focuses on Spanish for Kids. Take a look at some of the current job opportunities available to those with Spanish language skills at Spanish Jobs in Canada or in USA.